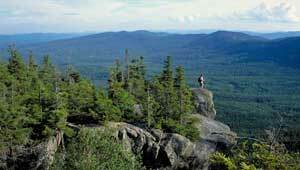 In 2001, TPL began working with the Tumbledown Conservation Alliance and the Maine Department of Conservation in a multiyear effort to protect nearly 30,000 acres of sweeping alpine vistas, popular hiking trails, and productive forests in one of the state's most well-loved mountain areas—the Tumbledown Mountain and Mount Blue State Park region of western Maine. Thanks to strong support from the Maine Congressional Delegation, the Bush Administration, the state of Maine, and hundreds of private supporters, within 5 years, almost 26,000 acres had been conserved. Today, The Trust for Public Land, Maine is building upon the success of this effort in its Great Northern Forest program.